Is there a future for you in the website design and development business? I believe there can be, but your success will be determined by your ability to do more than just designing and building a good-looking website. I’ve been in the web design and development industry for 20-years. When you’ve done anything for a long time, you stop every now and then to reflect on where you’ve been and where you might be going. All things considered, 20-years is enough time to pick up some things. It’s enough time to work through a myriad of challenges and learn things on a deeper level. I’m saying all of this up front because I want to talk about the future of running a business in this industry. If history is any indicator of things to come, I have a pretty good idea where this and similar industries are going. From the done-by-hand days until today, there’s a pattern that becomes impossible to miss once you’ve recognized it. Think about this for a moment… there was a time when books were bound by hand. When the clothes in the drawer were sewn by hand, washed by hand, etc. Before automation, most things were done manually. During my high school years, I took a typing class because I wanted to be able to type at least 70-words per minute. There were three guys in the class including me. One quit. The rest were girls. That may tell you a little bit about the times. Today, you can dictate everything – including a whole book if you want to. Voice to text makes it possible. Technology drastically reduces or outright eliminates the need for certain skill sets. I’d like to apply this pattern to the web development industry in general and the web development business in particular. I started my journey in what was the online equivalent of the done-by-hand days. I almost got started even further back than that in 1978. If this were a movie, this would be the point where the screen would get sort of misty. You’d see the calendar flipping back through the months and years while music from the Bee Gees played quietly in the background. That was the year Saturday Night Fever and Close Encounters of the Third Kind hit the theaters – just to put the journey in perspective. It was the year one of my very first girlfriends asked, “Do you want to try a long one?” after we kissed for the third time. Most importantly, it was the year my uncle asked my mother if she thought I’d be interested in having a computer. 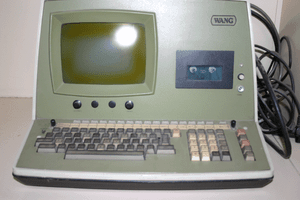 A “Wang Computer” to be more precise. I almost had this beauty! Her response was, “What is he going to do with a computer?” I guess my uncle didn’t have a convincing enough response because it wouldn’t be until the 80s that I sat down in front of my first PC. Yeah, it’s easy to get nostalgic about things that seemed like a bunch of crap at the time because everything changes. Long, slow, and cumbersome are great adjectives to describe the learning process back in the early days. The visual, point-and-click approach was still a few years off in the late 80s. Speed, efficiency and the continuous need for innovation (and the profits that come with it) were the current driving forces in the marketplace back then as they are today. The whole web development industry was born right in the midst of it all. Like a baby in the backseat of an old taxi speeding down a dirty, congested, city street. Believe it or not, this program brought web development within the reach of many aspiring designers. 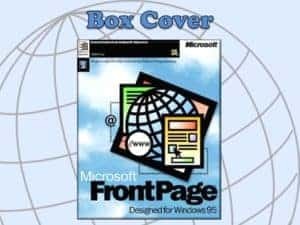 When Microsoft rolled out Front Page for Windows 95 back in 1995, it was the first step in bringing web development capabilities into the hands of the average website developer in the making. I was one of them. A quick side note; in 1995 I found myself looking back to 1988. Looking back, 1988 was a crappy year (hair bands aside). That was the year I realized my college education wasn’t worth a damn. Actually, that’s a bit harsh. I did learn how to study and pass tests during those years. That’s something. The dot-com craze was sweeping the landscape. My skillset at the time was elementary level at best. I was learning – but it wasn’t fast enough. The train was leaving the station quickly. I felt like saying, “Because I don’t know enough. I’m barely out of the tech kiddie pool. I’ll drown in the deep end.” I kept those thoughts to myself. I would get there, but it took time. By the late 1990s, I saw there was potential in web development and jumped right in. It was like buying a ticket to what was previously a sold-out show. Even if I was sitting in the cheap seats all the way up in the nosebleed section, I was still there. The budding industry seemed to offer the right blend everything for me. I jumped in and the rest, as they say, is history. Back in the day, you were born in a town, you grew up in that town, got married in that town, had kids in that town, etc. Ultimately, you died and were buried in that town. Careers followed a similar pattern. Your entire career would play out within what you might call a five-mile radius. Back in 2015, the average adult in America moved 11 ½ times on average in their lifetime. That number is growing. The average adult will also hold as many jobs in a lifetime. What does all that have to do with web design, development, and marketing? In my own career, there’s a five-year pattern. Five years. Let that sink in. I can see the pattern pretty clearly now. In that time, I’ve had to transform my products, services, and other offerings 5-times. Do you see how the numbers work out in relation to other things in the world around us? It means during a 50-year career, you will have gone through 10 significant changes in this field. One of these change-cycles hit like a tsunami around 2006 for me. By that point, my skillset was tired and dated. Mentally speaking, I was tired and felt a bit dated myself. The success I experienced between 1998 and 2006 was great. It wasn’t all roses, though. Eventually, if you don’t make gradual changes along the way, the need for change can hit you like a punch you never saw coming. You find yourself getting up from whatever floor circumstances knocked you down onto… and you tell yourself not to ever “make that mistake” again. What took my web design business from 1998 to 2006 wasn’t going to get me much further. Using Robinson’s words, “I could see the openings, but I just couldn’t connect. As a matter of fact, more than just a few of my contemporaries threw in the towel right around that time. I decided to go back to the basics and rebuild from there. The industry was ripe for innovation. And it came. Even so, I basically found myself “out in the desert” from 2006-2009. It was, as they say, a time of testing. I came out of that period with a sharpened skillset to take me forward into the next decade. Content Management Systems Changed the Game. Again. WordPress changed the web development game for the foreseeable future. I briefly toyed with it in 2007 but I jumped in, fully committed to the path in 2008. The open source approach ticked all the right boxes as far as I was concerned. Efficiency coupled with the ability to morph with the changing landscape – WordPress didn’t just fill a need… it plugged a gaping hole in the industry. With it, I was ready to move into the future, and thankfully, take my clients with me. WordPress was a game-changer, there’s no doubt about it. Not only did it catch on and spread like a wild-fire within the online world as a whole, it also reshaped and restructured web design & development community while doing so. This is a highly competitive industry. It always has been. You could argue that we’re at a point where the supply, in some respects, is beginning to exceed the demand. Couple that with the fact that most technical people hate selling and you can see why it has become so challenging. Nothing really sells itself. Not anymore. And I’m guessing you didn’t go down the development road because you enjoy selling? Most likely just the opposite. I could have hired a copywriter when I first got started to help me develop a sales system. I didn’t go that route because I couldn’t find a copywriter who understood the market. I wasn’t comfortable with the hard-sell approach either, so I decided to pass on that option. It was in 2002 that I first introduced other services into the mix such as web hosting, email marketing, site maintenance, etc. I didn’t realize it at the time, but these additional services would become the foundation for the future. You’re exactly right. An agency brings a wider spectrum of services to the table. But from a marketing standpoint, it’s difficult to market multiple services effectively. It takes a while to build up a clientele. But I found that it was much easier promoting one, main service instead of several. I started as a one-man agency. With almost zero options in terms of automation, accomplishing daily tasks was like a scene out of a Bruce Lee movie where he fights 20-guys at the same time. My startup advice would work wonders for you if this were 1998 again. I say that facetiously, but, maybe you don’t need as much advice as you think? A simple common-sense approach may get the job done. I say this because overthinking things usually leads to inaction. That’s been my experience. Overcomplicating things can bog down what might otherwise be a very effective course of action. You’re creating additional layers of “mental-bureaucracy” for yourself to wade through when it’s not necessary. I make it a point to talk with other business owners regularly. To get real-time insights on what’s happening in my “world” with the people around me. You’d be surprised how many local businesses DON’T have the basic marketing systems in place online. Something as simple as email marketing is either overlooked or underutilized. You can change that. There’s nothing wrong with a brochure type of website. But, why not give people the opportunity to sign up for something or get more information? Again, I’m just talking about the basics. Nothing fancy or high pressure. Some offline businesses collect email addresses at their place of business. That’s how they build a list of clients and customers they communicate with every month. You don’t need a marketing degree or years of experience to get results using simple, basic methods. Most mistake the basics for no longer being relevant or effective in a competitive environment. They’re attracted to more complex, “scientific” approaches. Let me state for the record, the tool doesn’t make the hand holding it more proficient when it comes to sales and marketing. The tool just manifests the skill level of the hand holding it. Think of golf clubs or tennis rackets. Owning the best equipment doesn’t make you a great player. Most of us, myself included, don’t flourish using a complex approach to ANYTHING. I don’t feel the need to make any predictions here beyond pointing out the obvious. There are more options today when it comes to website development than there have been in the past. The number of specialty services (shopping cart systems, marketing funnel services, etc.) are increasing as well. Building a decent site will be within the grasp of an ever-increasing number of people moving forward. All that said, a website is still a machine operating within an even larger, more complex mechanism. I’m talking about the online business machine with all its various components, options, and complexities. Would it be an exaggeration to say that marketing, SEO, and social media (I’m just scratching the surface) are way beyond what the average business owner has time to research, understand and implement effectively? Think about the time you’ve invested in getting a handle on all these different things? Just cutting through the fluff can be challenging. Even with some extra, available time, the mental bandwidth just isn’t there for the average business person anymore. Maybe your clients aren’t convinced what will or won’t add to their bottom line when it comes to online services? There are a lot of gray areas here. Very few are still willing to commit a chunk of money to something they’re not convinced will really work for them. They’ve already been down the smoke and mirrors road, I can almost guarantee it. If anyone understands this, you probably do (or should). Think of what you’ve been through building your own business? All the junk, false promises, crappy tools or courses that promise the mansion but deliver a hut. There’s a gap here you can fill. Based on your personal experience, you can provide a foundation and some stability in these areas as they relate to your client’s business. Whether you do this via email, video, audio or in person – it’s up to you. All that’s required is that you stick to the basics. Help your clients connect the dots and take the next step in the sequence as it pertains to their business… keeping things simple. This is the approach I’ve used in my own business. I believe it will work for you, too. If you demonstrate your value, it’ll take 1/10 the effort to sell it going forward. If you teach, guide or consult – sticking to the basics, you’ll be able to do so with greater confidence. The basics will get the job done more often than not if they’re applied to a solid product or service. I’m sure you realize that building a website is just the beginning. If the website is viewed as a foundation, why not continue to help your client with the other elements necessary to help it be a success?